Father of senator Arashukov to remain in jail as part of $455 mln gas embezzlement case | Russian Legal Information Agency (RAPSI). MOSCOW, February 11 (RAPSI) – The Moscow City Court on Monday dismissed an appeal lodged by Raul Arashukov, the father of senator Rauf Arashukov and CEO of Gazprom Mezhregiongaz, against his detention in the 30-billion-ruble natural gas embezzlement case ($455 million), RAPSI reported from the courtroom. On February 1, the court detained Arashukov until March 30. Moreover, the court placed branch manager of Gazprom Mezhregiongaz Stavropol Guzer Khashukoyev, CEO of Gazprom Gazoraspredelenie Astrakhan and Gazprom Mezhregiongaz Astrakhan Ruslan Arashukov, first deputy CEO of Gazprom Gazoraspredelenie Stavropol Nikolay Romanov and CEO of Gazprom Mezhregiongaz Stavropol Igor Travinov in jail for the same term. According to investigation, all of them are involved in gas embezzlement from Gazprom company. The top managers have been allegedly stealing gas from the state-run energy giant over a period of several years. Raul Arashukov pleads not guilty and calls the case against him fabricated. On January 30, the court put his son, Russian senator Rauf Arashukov, in detention for two months. He stands charged with murder, participation in a gang and witness tampering. According to investigators, the Federation Council member was involved in the murder of a Karachay-Cherkessia public youth movement’s deputy chairman Aslan Zhukov and the republican president’s advisor Fral Shebzukhov in 2010. He has pleaded not guilty. Moreover, investigators believe that the senator is implicated to natural gas embezzlement from Gazprom company. He was arrested in the Federation Council on January 30. 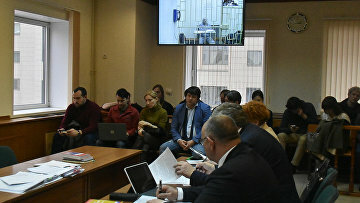 The upper house of parliament stripped Arashukov of his immunity and gave consent to his prosecution upon an application by the Prosecutor General. 18:09 11/02/2019 The Moscow City Court on Monday dismissed an appeal lodged by Raul Arashukov, the father of senator Rauf Arashukov and CEO of Gazprom Mezhregiongaz, against his detention in the 30-billion-ruble natural gas embezzlement case ($455 million).